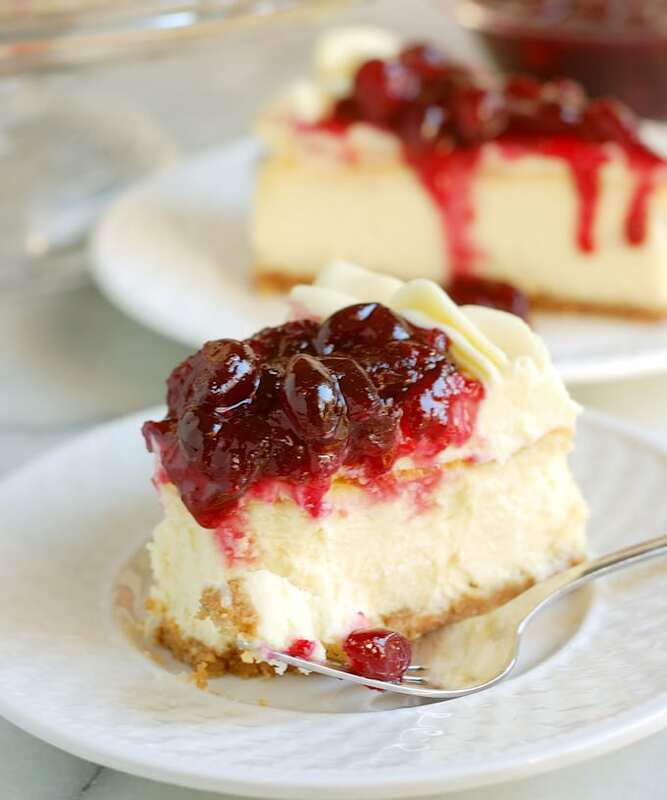 White Chocolate Cranberry Cheesecake is the perfect dessert for your holiday table. You’ll love this silky white chocolate cheesecake topped with whipped white chocolate ganache and jewel-like Cranberries in Red Wine. 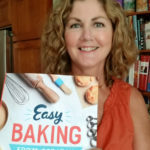 To help you plan the perfect holiday dinner the #SundaySupper members are offering our Best Holiday Dessert recipes. 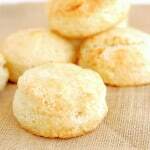 Thanks to T.R from Gluten Free Crumbley for hosting today’s event. Of course I was excited when I saw the theme for today’s event. Cause, you know, desserts are my thing! I also knew right away that I wanted to make a dessert that included Cranberries in Red Wine, a dish that shows up on my Thanksgiving and Christmas table every year. 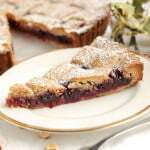 Not only are Cranberries in Red Wine a great side dish to the main meal, they’re also a perfect component for festive holiday desserts like my Cranberry Linzer Tart. 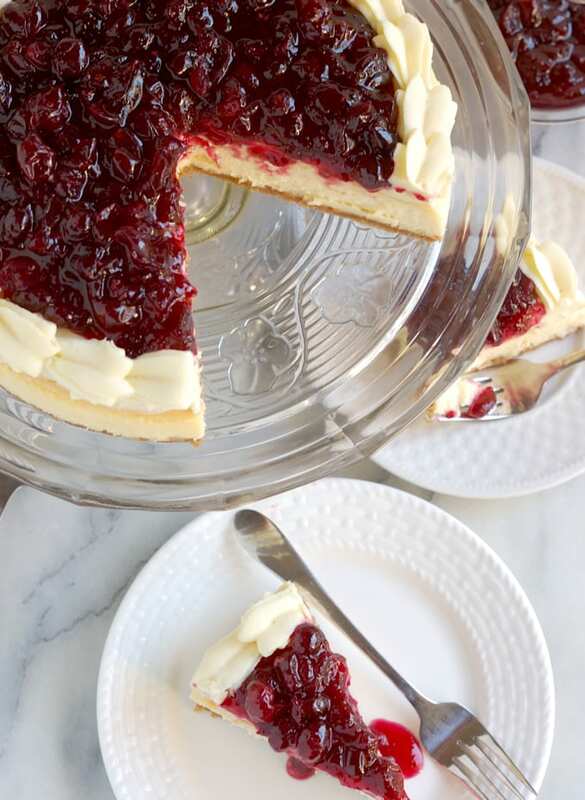 I created this White Chocolate Cranberry Cheesecake especially for this #SundaySupper event, and boy am I glad I did. It’s absolutely delicious, if I do say so myself. 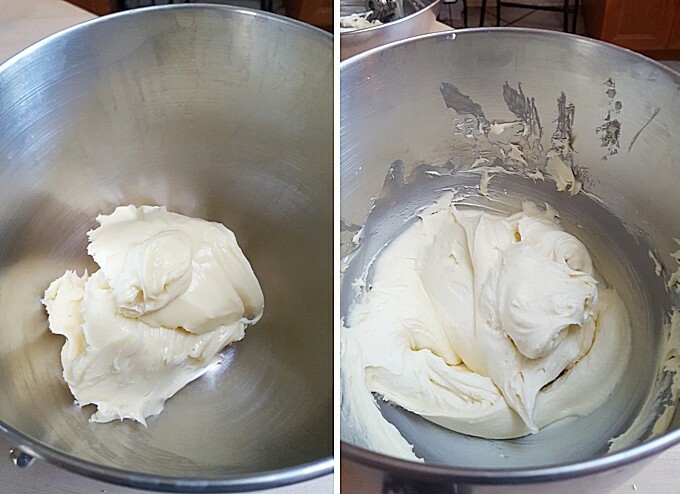 White chocolate ganache before and after whipping. I’ll admit that I’m not the biggest white chocolate fan. In fact, white chocolate is not really chocolate at all since it doesn’t contain any chocolate liquor (that’s the cocoa mass that makes chocolate, chocolate). White chocolate is made from cocoa butter, milk solids, milk fat, vanilla and sugar. But I do like white chocolate paired with a strong flavor that has some bitterness or acidity to offset the sweetness. I love white chocolate with coffee, citrus fruits and raspberry. Tart cranberries cooked in red wine are the perfect foil for the sweetness of white chocolate cheesecake and white chocolate ganache. I wish you and yours a sweet holiday season full of love and dessert! Hold the ganache at room temperature until ready to assemble the cake (this can be done the day before). Pour the White Chocolate Ganache into a mixer bowl and whip on medium speed until the ganache is aerated and has lightened in color. Immediately spread 3/4 of the ganache over the top of the cheesecake. Spread 1.5 cups of the cranberries onto the top of the cake. Reserve remaining cranberries to serve along side the cake or keep for another purpose. To make clean cuts, dip the knife in hot water then wipe clean between each cut. If you don't have a piping bag you can build up a border with the spatula while spreading the ganache onto the cheesecake. This border will keep the cranberries from dripping down the sides of the cake. Sharpen your sweet tooth and peruse these Best Holiday Dessert recipes by the #SundaySupper group members. Previous Post: « How to Make Chipotles in Adobo Sauce at home. Thanks Liz. Come on over to PA and I’ll have a slice for you. I’ve been fulling around with cheesecake all week and they have been crappy. Can’t wait to try this! I hope it works out for you, Denise. Let me know how it comes out. I love cheesecake and this flavor combination sounds amazing! Thanks. It is a tasty combination. 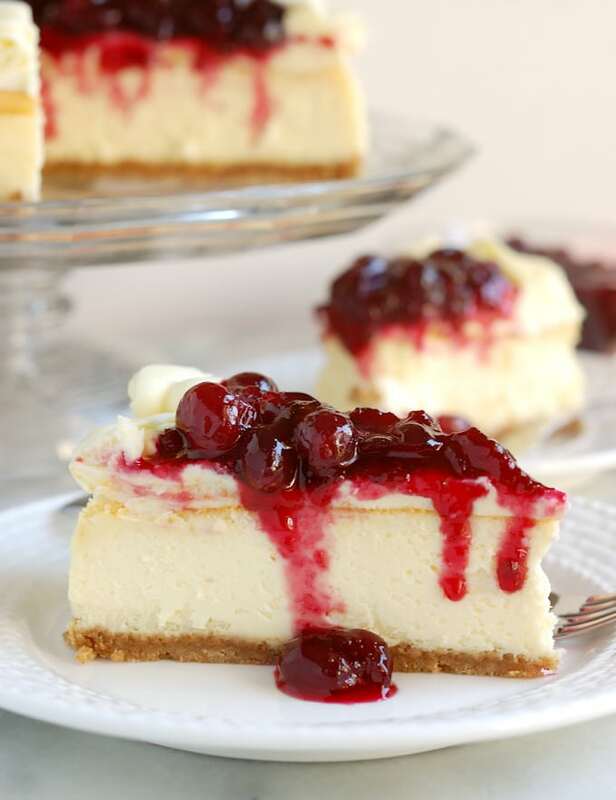 The combo of the sweet white chocolate and tart cranberries is indeed heavenly. Gorgeous photos! Pinning! Thanks! The photos are always a struggle for me. What a beautiful cheesecake, your photos are beautiful as well! This would brighten any table and become a tradition for the years to follow! Glorious! You piped that ganache so beautifully! I bet the cranberries add just the right contrast in flavor. 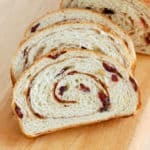 I usually find white chocolate and raspberries to be too sweet, but I think cranberries would be THE perfect substitute. This recipe looks amazing! Thanks, Monica. The cranberries are a nice foil for sweet white chocolate. Thanks for sharing this recipe, looks d e l i c i o u s ! Looks delish!! 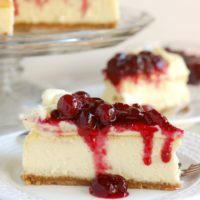 I’ve not thought to make a cranberry cheesecake! On to do to list now! I hope you like it, Amanda. As soon as I can get my hands on fresh cranberries, you can bet your bottom dollar this dish will make an appearance in my kitchen. 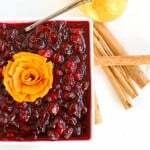 Cranberries mulled in red wine sound splendid. 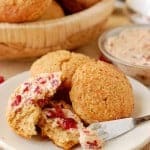 Cranberries and cream cheese are a winning flavor combination. Nicely done! How long did you end up baking yours? I was going to start with 50 minutes. Hi Alessandra, Generally, I find the cheesecakes take about 45-50 minutes to bake. I just baked a chocolate cheesecake this week and both times it took just about that amount of time. 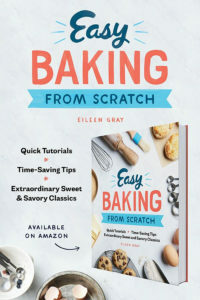 Hi Eileen, I really love this recipe. I was wondering if I can freeze this pie for later. If so, what are the steps to freeze and thaw? Also, will I use the same process to freeze the Margarita Pie as well? Thanks for your help. Yes, you can freeze this cheesecake. After it’s baked and chilled (without the topping on, of course). Double wrap the cake in plastic wrap and freeze. Unwrap and thaw in the refrigerator before adding the topping. 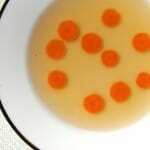 The topping can be made and stored in a covered container in the refrigerator for at least 2 weeks. You can freeze the Margarita Pie without the whipped cream topping. Leave the pie in the pan (probably best to use a disposable aluminum pan), double wrap and freeze. Again, defrost in the refrigerator then add the whipped cream topping the day you plan to serve.